The development team at CW Sonderoptic GmbH has been honored with the Scientific and Engineering Award® from the Academy of Motion Picture Arts and Sciences, the prestigious film industry accolade for technical products and innovations, for the Leica Summilux-C (Cine) lenses. Yesterday the Academy presented the Academy Plaque® to Iain Neil (optical design) and André de Winter (mechanical design) in Los Angeles in the course of a gala evening at the Beverly Wilshire Hotel. 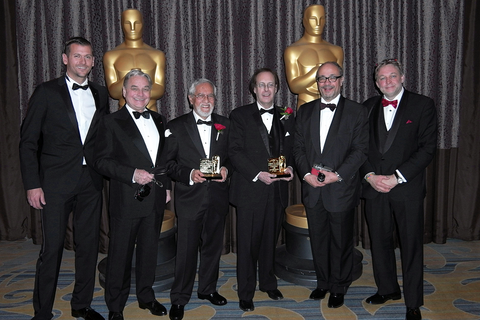 With the Science and Technology Awards, the Academy honors individuals and companies whose inventions and innovations make a significant and lasting contribution to the further development of the motion picture industry. Every year the Academy presents the awards two weeks before the Oscars® are awarded for the best movies, best actors and actresses, best directors, and best camera. The Leica Cine lenses set entirely new standards and have since become invaluable assets in the movie industry. Leica lenses were used in the filming of numerous major feature film productions over the last three years, including movies like Birdman, The Theory of Everything, X-Men: Days of Future Past, Gone Girl, and Dawn of the Planet of the Apes. Prominent cameramen around the globe appreciate the technical and creative properties of the Leica Cine lenses – for instance, the consistently high illumination across the frame for all focal lengths and the linear focusing scales that make camera work on the set much easier. Their superior imaging qualities, compact dimensions, and low weight make them particularly versatile and mobile. This picture is supplemented by dazzling contrast rendition, extremely low chromatic aberration, and smooth transitions between planes of focus.